Ben Hur, Quo Vadis, Cleopatra – these are just some of the classics that were shot at Cinecitta Studios on the outskirts of Rome. However, the most imaginative body of work to emerge from these gates is arguably that of the great Italian director Federico Fellini. 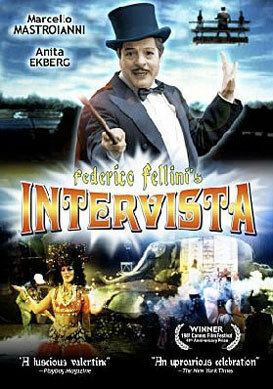 To celebrate the 50th anniversary of Cinecitta, Fellini was asked to make a television special about the place but given his aversion to the medium, he developed the concept into a mockumentary film instead. Intervista, or ‘Interview, is his extraordinary tribute to these legendary back lots and the flights of fancy he created there. Loosely structured as a film within a film within a film, Intervista features the maestro himself directing an adaptation of Franz Kafka’s Amerika. A Japanese television crew shadows him, interviewing him about his life which proceeds to unfold before our very eyes. A young Fellini (played by Sergio Rubini) is seen entering Cinecitta to conduct an interview with a famous actress and being instantly smitten by the circus-like environment that envelops him. Later, Fellini’s famous leading man Marcello Mastroianni appears on a cherry picker dressed as Mandrake the Magician and he and the maestro decide to pay a visit to Anita Ekberg who co-starred with Mastroianni in Fellini’s masterpiece La Dolce Vita. Swathed in a voluminous orange wrap, Ekberg is, as Fellini forewarns, ‘epic’ – ‘a Goddess’ no less. She and Mastroianni haven’t seen each other since their collaboration back in 1960 and to mark the occasion, Fellini conjures up a screen on which he projects their iconic romp in Rome’s Trevi Fountain. With just a melancholy piano tinkling in the background, the scene brings a tear to Ekberg’s eye and a lump to the throat of her audience. Fellini referred to this, his penultimate film, as “a friendly chat among close friends”. For the humble movie buff, let alone a full tilt Fellini fan, it’s quite an honour to be included in that intimate circle.